NEW YORK (CNNMoney) -- Google is killing off Buzz, the company's 18-month-old first try at creating a social network. Buzz will be shut down "in a few weeks," Google said in a blog post Friday, as the company redirects its social focus toward its new Google+ network. The move is part of a broader effort at Google to cull its product portfolio and shut down low-profile offerings. "More wood behind fewer arrows" was the way Google put it in the July blog post announcing its first wave of product eliminations. Google added a few more projects to the scrap heap on Friday, including Code Search, a tool for finding open-source code on the Web, and Jaiku, a Twitter-like microblogging service that Google acquired in 2007. Eliminating Buzz will help Google close the book on one of its most explosive missteps. 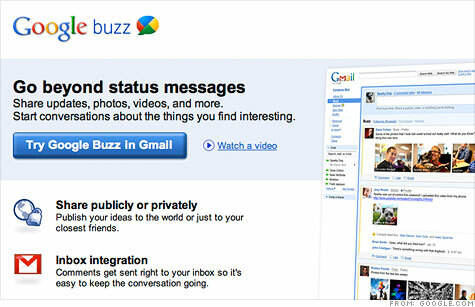 When Buzz launched in February 2010, Gmail users were furious to discover that the network's default settings automatically set members to follow their most e-mailed contacts -- and then posted those contacts publicly after a user "buzzed" about something. One woman wrote a profanity-laden, much-circulated blog post about how Buzz revealed some of her Internet activity to her abusive ex-boyfriend and his friends. Within two days of Buzz's launch, Google (GOOG, Fortune 500) made changes to the defaults that largely satisfied the concerns of users and organizations dedicated to information privacy. But the damage was already done: Critics wondered openly about Google's dedication to user privacy. The debacle lead to a class-action lawsuit and a settlement deal with the Federal Trade Commission, which now requires Google to undergo annual privacy audits. Users won't be able to post on Buzz after the shutdown, but they will be able to view their existing content on their Google Profile and download it using an export tool called Google Takeout. "We learned a lot from products like Buzz, and are putting that learning to work every day in our vision for products like Google+," Google's vice president of product, Bradley Horowitz, wrote on the company's blog. Google said in an earnings report Thursday that its three-month-old Google+ social network, which is more like Facebook than like Buzz, now has 40 million users. That's a big increase from the 10 million users Google+ had at the end of Google's last quarter, when it remained in a "limited" trial phase. The network opened to the public in late September.